Sustainability has been the benchmark ever since Afriflora was founded in 2005. Afriflora Sher’s main objective is to grow and sell roses that have been sustainably cultivated. This is done while respecting people and the environment. Afriflora Sher possesses the largest rose farm in the world. Aalsmeer-based Afriflora processes 3 to 4 million roses every day. After processing, roses are either sold via auction or are sold directly to customers via “direct sales”. 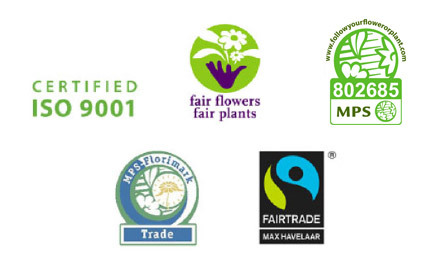 In order to have a sustainable business, Afriflora Sher is working with these partners.